When I first contrived this silly little project in 2016, I sat down and painstakingly compiled a list of all the one-word-birds in the world. At the time there were 145. To assemble this exclusive list I needed some criteria. The first is obvious: each bird’s common (non-scientific) name must consist of one, single word. Hyphenated names need not apply. This may seem sufficient qualification, but it was also important to designate an authority from which to reference these common names. In the birding realm, the accepted authority on names is the Clements Checklist of Birds of the World1. The reason this is important is that common names for birds are variable, meaning that the same bird may be called different things in different places, or by different people. I will deal with the problems this creates in a later post, but suffice it to say that a standard was required and Clements is that standard. So with this decided I pored through the roughly 10,500 species in the checklist and picked out those rare beasts with those special names. I collected them in a neatly-organized spreadsheet and began to plot the pieces I would write, and the angles each would use. Then I forgot about the project for a year. The thing about Clements is that every year it is updated to reflect changes in our knowledge of bird taxonomy, and occasionally to acquiesce to the whinings of nerdier bird-nerds than myself. So when I revived OneWordBirds in 2017, I thought it a useful and prudent exercise to review the most current list and ensure that nothing had changed. But everything had changed. Ok, so I’m being a bit melodramatic. About 140 species had actually stayed the same. Several species were lost from the list, mostly falling victim to species splits. This means that what previously seemed to be a single species (like Silktail, for example) was discovered to be two distinct species (like Taveuni Silktail and Natewa Silktail) and renamed accordingly. To my delight however, a few species were also gained due to spelling changes. You can look forward to Secretarybird (formerly Secretary-bird) making an appearance on this blog at a future date. There was one bird, however, whose removal from the 2017 list struck me like an arrow in the chest. A bird so singular and so large in my mind that its absence made me question this entire endeavour. A bird that is as bizarre as it is beautiful: the formidable Lammergeier. Or, since it’s 2017 now, the Bearded Vulture. I would love to know with whom they spoke to determine the “prevailing usage,” because it most certainly was not me. And I would love to know what self-respecting birdwatcher, when presented with the choice, would elect to refer to this magnificent creature as Bearded Vulture instead of Lammergeier. I would love to meet that person, if only to swat them with a rolled-up newspaper and demand they look at what they’ve done. Now I realize that to many people, this may seem like a mild overreaction. I understand (or at least I try to) that most human beings believe they have more important things to concern themselves with than what we call this bird or that bird. I will even concede that there may be more egregious injustices in the world at this very moment. But for me, right now, sitting alone in my apartment half-buzzed on cheap whiskey, this is the battle I choose to fight. If you will permit me a moment, I will explain to you why this incomparable bird deserves its mononym beyond a shadow of a doubt. But first, in the interest of full disclosure, I must confess that the name Bearded Vulture actually makes more sense than Lammergeier. Firstly, it’s true that the bird is a vulture, albeit a sort of distant-cousin, black-sheep member of the family. Secondly, unlike other vultures it has a fully-feathered head, complete with bristle-like feathers which form a sort of beard-facsimile on the bird’s chin. Ergo Bearded Vulture does have a certain air of logic about it. Lammergeier, on the other hand, means something like “lamb-vulture” or “lamb-hawk” in German, and stems from the belief that the bird attacks lambs, which it does not. What Lammergeier lacks in accuracy though, it more than makes up for in mystique. To the uninitiated, the name Lammergeier conjures all manner of possibility. It sounds almost mythical, like some demon beast of lore who steals souls or haunts castles. It ignites the candle of your imagination in a way that Bearded Vulture never could, and whether the bird itself is as you first imagine it or not, it certainly does not disappoint. How is this even a thing? 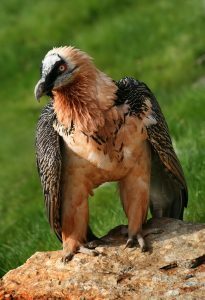 The Lammergeier is big, to start, standing nearly four feet tall and with a wingspan approaching ten. Its breast, neck, belly and legs are clad in shaggy, rust-coloured feathers, starkly contrasting with its dark wings. Its head is white, but punctuated by a black slash on either side, concealing yellow eyes ringed with red. A wispy beard covers the base of a deeply-curved beak. It is almost unreal to look at, and your brain struggles to reconcile it with reality. But as bonkers as it looks, the real magic of the Lammergeier is what it eats: bones. 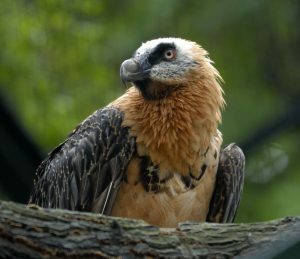 The Lammergeier is unique among birds, in that its diet consists of up to 90% bone, which it scavenges from dead animals. Its strong stomach can digest startlingly large bone fragments to access the nutritious marrow inside, but if a bone is too big to swallow, the Lammergeier uses a special trick. Grasping the bone in its talons, the bird lifts it high into the sky, then drops it with great precision onto a rock below, shattering it into manageable pieces2. In a very un-vulturelike fashion, the Lammergeier will even occasionally use this method to kill live prey, including tortoises and small mammals. Sadly, like many vultures, this incredible bird may be disappearing3. In the European, African and Asian mountain ranges where it lives, it has been historically persecuted due to the erroneous belief that it may hunt children or domestic animals. Presently it is threatened by habitat degradation, contaminated livestock carcasses, and poisons used to kill livestock predators. Conservation efforts are underway and there is hope for the Lammergeier, but it is far from out of the woods4. It seems to me that, like the Lammergeier, the one-word-bird is a dwindling phenomenon. Of the 145 that existed in 2016, only 143 now remain. As our knowledge of taxonomy grows and we continue to split and rename species to fit this new understanding, that number will only get smaller. And if a bird as dramatic and spectacular as the Lammergeier can’t hold its moniker against “prevailing usage,” what hope is there for the others? Conserving names may be less important than conserving the species itself, but I believe it has value too. If we want people to take an interest in nature and conservation, we need to grab their attention and engage their imagination. Names like Lammergeier can do that. So I urge you, fellow bird-nerds, when confronted with the choice, hang on to these rare, special names against the tide of prevailing usage. Future generations will thank you.